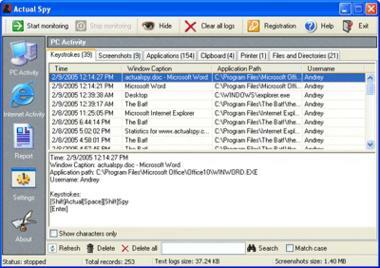 Actual Spy is a computer activity monitor and keylogger, that allows you to keep track of what is happening on your computer. 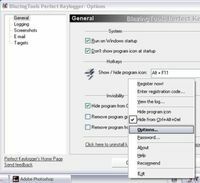 Actual Spy includes a keylogger, screen capture, program log, clipboard monitor, printer monitor, websites monitor and records all changes in file system. It can control all user actions and allows you to monitor system events. It runs hidden in the background, and automatically logs all keystrokes, and can also take snapfshots of the desktop. The interface can be password protected and the log files are encrypted. You can view the reports as HTML or plain text, and also have them emailed to you automatically. 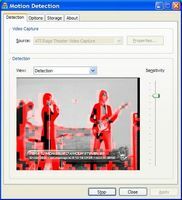 Actual Spy is a must for any computer user. It helps system administrators keep an eye on their systems. Helps managers to have complete control over their company's computer usage. Helps parents to know and control the programs run and web sites visited by their children. Helps any computer user see what activities took place in their computer. System requirements: Pentium 333 processor or higher, 64 MB RAM.